The 23rd Chapter of Matthew's Gospel contains seven "woes" Jesus declared over the Pharisees. Scholars agree that these woes were essentially judgments against them -- things God would hold them responsible for. The woe listed above in today's key verse we reference all the time. God is saying that they travel the world to make one single convert but by doing so make him twice the son of hell that they are. This is powerful and relevant to the church today that is obsessed with reaching as many people as possible with a gospel that cannot save them. Compounding matters is they will think they are saved and thus be harder to convince that the christ they have followed is false. Hence the twice the son of hell judgment. The mega church, purpose driven industrial complex was not satisfied with just cornering the faith market in America. Not when there was money on other continents. So we have been exporting our heretical church schemes to places like South America and Africa for many years now. Realize that half of the ten richest pastors in the world are from Africa, the poorest continent. It appears that after years of spiritual abuse and making money off of the poor at least one country has had enough -- and it isn't the United States. No beloved, it is Rwanda. The government of Rwanda recently passed reforms regarding churches. They improved health, safety and noise regulations for buildings operating as churches. They demanded now that pastors have a degree in theological education from an accredited school. The law also prevents church leaders from urging their congregants to fast for lengthy periods of time, such as the 40-day Jesus fast. It seems that many Rwandan pastors were promising increased blessings from God should people endure such fasts. I wonder where they got that idea? Rwanda also improved the financial transparency be requiring churches to explain the sources of funding and keep all donations in a known bank account. It seems the government is getting sick and tired of American style prosperity gospels being preached in their country. There are numerous complaints about poor congregants being fleeced by pastors who live in luxury. So the government is acting in a protectionist mode over its citizenry who they see being robbed. 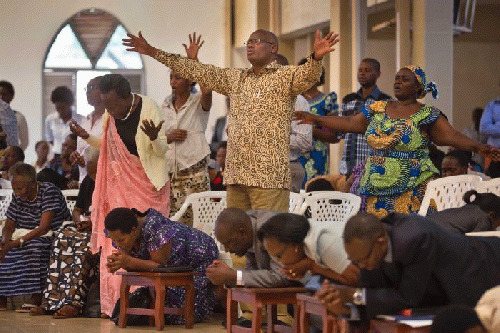 When asked for comment to the criticism of restricting worship, the Rwanda Government Body responded that they were not targeting churches and the reforms were aimed at improving the safety at such locations as well as dealing with "troubling behavior of unscrupulous individuals masquerading as religious leaders." Beloved this is the global legacy of the American church today. Instead of preaching the Gospel they taught them how to build a church. Instead of teaching them sound doctrine, they taught them how to steal from their people on behalf of God. I know that some of these measures seem harsh but at least the Rwandan government is trying to protect their people from themselves. They are trying to fend off the wolves that have descended upon their country. The sad thing is we brought them the wolves. Instead of exporting the Gospel we exported the wolves and then we set them free across the African continent. You will never see these types of considerations for protection coming from the church itself in this country. Not when there is still money left on the table. Like the Pharisees they will travel across the world to make converts but by doing so make them twice the son of Hell that they are. It is a shame when the carnal government of Rwanda has better discernment than the America church. We sent our missionaries to Rwanda. Now Rwanda says keep them. How sad.